It is surprising that a brand which has been around in India since 2003, Hardys is hardly that well-known. Well it seems that things are about to change now. Glenn McGrath, one of the greatest fast-medium pace bowlers the world has ever seen, has been on a blitzkrieg of promotional activities for Hardys wines, in his capacity as their brand ambassador. Since the last few days he has been visible everywhere, in newspapers, on television, on social media, talking about his cherished cricketing moments and, of course, Hardys, an iconic wine brand from Australia. The brand leverage of associating a cricketing legend like Glenn McGrath, a man who has taken more test wickets than any other fast bowler (563 to be precise) seems to be working in Hardys favour, especially in a cricket crazy nation like India. Hardys Wines is getting a great exposure, something it had lacked all these years. Efforts are on to revitalize the brand and what better way to do it than through cricket with which it shares a rich history steeped in tradition and heritage. Hardys is the official wine of Cricket Australia and England Cricket, having signed a three year partnership with both. The goal now is to take it to the next level in India and possibly overtake Jacob’s Creek, the other famous Australian brand which is the most sold international wine brand in India. A task not too difficult considering the fact that Hardys is the number one Australian wine brand in the UK and is a significant brand in mainland Europe. With a distribution network in over 100 countries around the world, it has a global presence in 54% of all wine drinking nations. India however is a tricky and challenging market. It is also a young market for wine in terms of a global perspective. A wine drinking culture is still to take roots even though more and more people are warming up to wine, largely due to the perceived health benefits and sophistication associated with it and also the fact that a huge middle class with a disposable income and a more refined palate is getting more adventurous in wanting to try out wine over beer & hard liquor. So what exactly does the most powerful wine brand from Australia, now owned by Accolade Wines UK, bring to India? 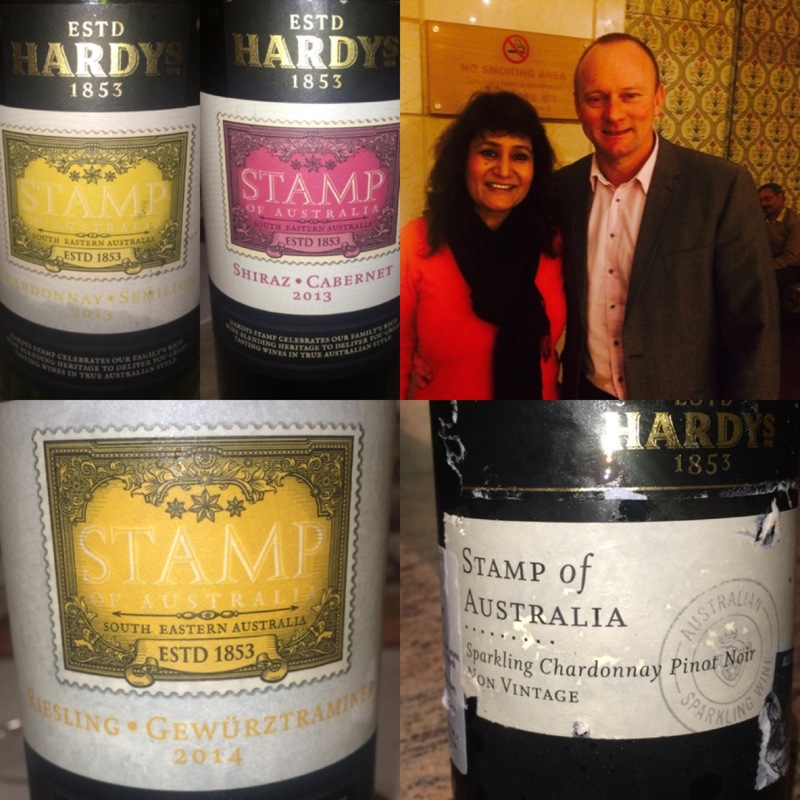 It is Hardys Stamp of Australia range of wines sold through Sula Selections, the import arm of Rajeev Samant’s Sula Vineyards, which is available in India. Presently the wines in its portfolio are, one sparkling Chardonnay- Pinot Noir NV (Rs 1320) two whites Chardonnay-Semillon (Rs 1060) Riesling-Gewürztraminer (Rs 960) and two reds Cabernet-Merlot (Rs 820) & Shiraz-Cabernet (Rs 1080) This is the entry level range of Hardys Wines “unchallenging” and “accessible” in terms of taste and what you would call “easy drinking” “everyday quaffing” kind of wines which, surprisingly, pair rather well with Indian food. These wines reflect the regional character and flavor of Southern Australia, and the great Australian “blending tradition” between regions and varieties. Glenn McGrath, brand ambassador of Hardys Wines and founder of McGrath Foundation, one of Australia’s leading breast cancer support organisations, presenting a memento to wine aficionado Rajiv Kehr, who had organised a private dinner in Glenn McGrath’s honor. Incidentally Glenn McGrath is not the only cricketer associated with Hardys. Nick Pringle, a former English cricketer who played for Somerset County (1986-1991) and shared the dressing room with the likes of Vivian Richards, Ian Botham, Steve Waugh and Sunil Gavaskar, is the Commercial Director of Accolade Wines UK which is the parent company of Hardys Wines of Australia. A few months back he was on a tour of India when I got a chance to meet him over a glass of wine and hear about the brand’s aggressive growth plans for India. 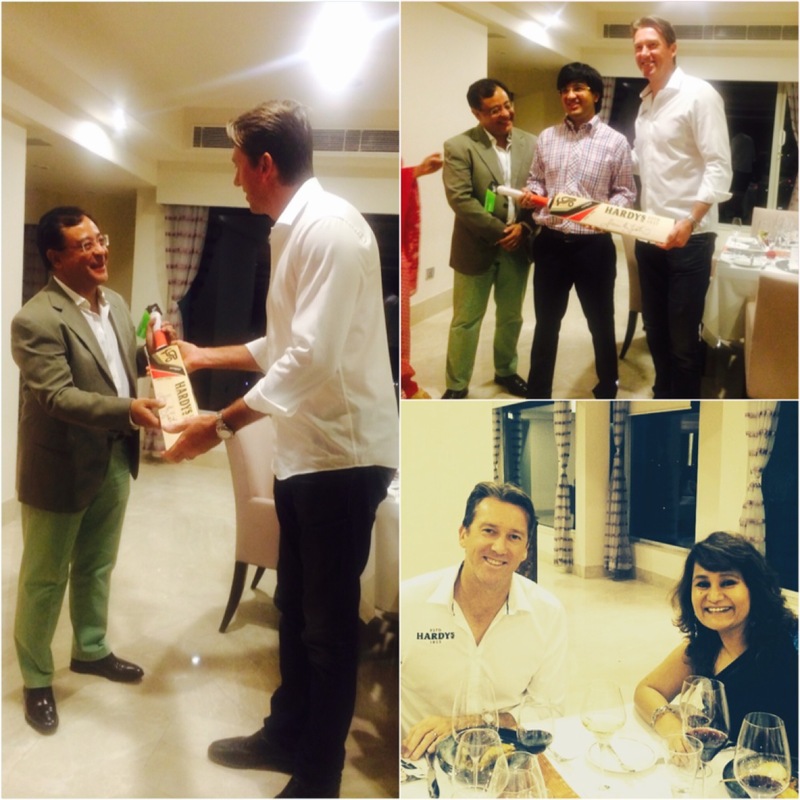 With Glenn McGrath’s recent whistle-stop tour of India, it is indeed apparent that both Accolade Wines and Sula Selections are pulling out all stops in their efforts to make Hardys Wines a popular wine brand in India.